As everyone knows graffiti is a common issue and although it dates back to Ancient Egypt the bottom line is in modern Britain it is vandalism. It is a massive problem in built up urban areas and especially in cities and industrial areas with large walls and big industrial areas such as train stations being covered in spray paint and markers. Unfortunately the person that owns the surface that had been defaced is responsible for the removal of the graffiti as well as the cost. As well as large walls graffiti artists tend to also focus on trains, pavements, electrical boxes, and road signs and due to this the graffiti can range from big murals to small sentences such as “Dan woz ‘ere”! Baring this in mind it means that there are many materials and surfaces that graffiti artists choose to cover. These can be brickwork on the outside of a house, paving slabs, metal shutters, aluminium, steel, render and concrete. 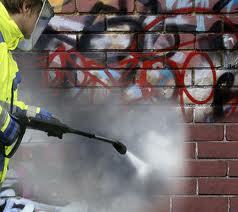 As well as this there are a variety of mediums that are used by graffiti artists. These can be spray paint, paint markers, adhesive stickers, permanent markers even ball point pens. Due to this extensive combination of the two there are different ways to remove the graffiti without damaging the surface even further than it already has been. To identify the best way to remove the graffiti as much information as possible about the surface and medium used needs to be relayed to us. This helps us to conclude what will be the best way forward without causing damage to the surface. We use a combination of chemical removers and techniques to gently remove the vandalism from your property. When taking the booking the information should be given over to our sales team who can then let our technicians know the situation who will then decide the optimal combination of cleaning method. Upon arrival the technician will dress into all appropriate personal protective equipment and survey the affected site to identify and confirm the optimum cleaning method. When this is confirmed the technician will then initiate the cleaning treatment. When the cleaning process is finished the technician will leave a report. JG Environmental Ltd, Thorney Business Park, Thorney Lane North, Iver, SL0 9HF. JG Pest Control London, Chelsea Harbour, London, SW10 0UX. JG Pest Control Slough, 46 Swallowdale, Iver Heath, Buckinghamshire, SL0 0EZ. JG Pest Control Kent, 28 Lynmouth Drive, Minster, Isle of Sheppey, Kent, ME12 2HS.